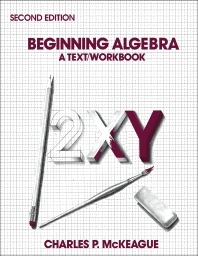 Beginning Algebra: A Text/Workbook, Second Edition focuses on the principles, operations, and approaches involved in algebra. The publication first elaborates on the basics, linear equations and inequalities, and graphing and linear systems. Discussions focus on solving linear systems by graphing, elimination method, graphing ordered pairs and straight lines, linear and compound inequalities, addition and subtraction of real numbers, and properties of real numbers. The text then examines exponents and polynomials, factoring, and rational expressions. Topics include multiplication and division of rational expressions, equations involving rational expressions, dividing a polynomial by a polynomial, factoring trinomials, greatest common factor, operations with monomials, addition and subtraction of polynomials, and binomial squares and other special products. The book takes a look at more quadratic equations and roots and radicals, including multiplication and division of radicals, equations involving radicals, quadratic formula, complex solutions to quadratic equations, and graphing parabolas. The publication is a dependable reference for students and researchers interested in algebra.